The Food Alphabet and More: Yummy Eats 2012! Win tickets here! YUMMY Eats, YUMMY magazine’s most anticipated eating and cooking fair is back! Already on its second year, it’s got more delicious food finds from partners specially chosen by YUMMY magazine! Slated to happen at The Rockwell Tent on May 26, Saturday, from 10:00 AM to 9:00 PM. Join the fun and watch cooking demos, discover new food favorites, and meet fellow foodies and chefs! With over 50 concessionaires, YUMMY Eats 2012 has bigger surprises in store this year. “We will have a wide array of food brands offering sweets, savory, and gourmet treats for everyone. All concessionaires will sample a couple of their bestsellers and also have products for sale, says Frances Ang, Associate Publisher of YUMMY magazine about what participants can look forward to in this year’s biggest food gathering. Watch this video and find out what's in store at Yummy Eats! Be there and experience a day of fun, food and so much more! With cooking demos from Chef Nino Logarte, Chef Bruce Lim and more. Also at the venue are various booths filled with Yummy activities. Satisfy your palate and get ready for a day filled with gastronomical delights as YUMMY Eats 2012 brings you the most talked about food finds in the metro! It’s a day you shouldn’t miss! Admission fee is only P150. 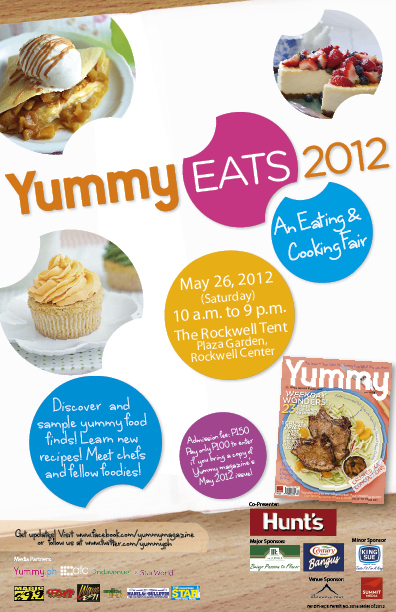 Participants who bring a copy of the May issue of YUMMY are entitled to a discounted entrance fee of P100. Must like The Food Alphabet and More and Yummy Magazine on Facebook.
" Let's cook, eat and have fun at Yummy Eats! See you there! tag@The Food Alphabet and tag@Yummy Magazine. Get to win tickets here! tag@friend1 tag@friend2 http://bit.ly/JeK18E "
Please make sure that you tag The Food Alphabet and Yummy Magazine and 2 of your friends. Post on the comments section below your complete name, email and Facebook url of your post. 2 lucky winners will win 2 tickets each, which they will claim on the venue and event day itself. Ticket giveaway starts now until May 23, 2012. Announcement of winners will be on May 24, 2012. One person one entry only. YUMMY Eats is co-presented by Hunt’s with major sponsors McCormick and Century Bangus and minor sponsor King Sue. Special thanks to our media partners Yummy.ph, Asian Food Channel, 2nd Avenue, Star World, Magic 89.9, 99.5 RT, Wave 89.1, Mellow 94.7, Manila Bulletin, The Philippine Star, and Summit Media. Be part of Yummy Magazine’s growing online community by visiting www.YUMMY.ph, liking us on Facebook via Facebook.com/yummymagazine, and following us on Twitter via Twitter.com/yummyph.